Bring a medium pot of salted water to a boil. Boil the rice noodles 5-6 minutes. Rinse with cold water to cool them down and drain well. Chop the rice noodles to about 1-inch pieces on a cutting board. Saute mushrooms in another 2 Tbsp oil. Season with 1/2 tsp salt and 1/8 tsp pepper. In a separate skillet, heat 3 Tbsp oil. Saute onion and carrots until soft (10-12 minutes). Set them aside. Combine pork, noodles, mushrooms, onion and carrots. Mix well. Season to taste. This is your filling. Place 2 Tbsp of mixture on wrapper. (All egg roll wrappers have folding direction on the package. I'll do my best to describe. Put the filling closer to one of the corners. Fold that corner over the filling. Roll up a little. Fold in the sides. roll and seal with the last corner. To seal, moisten unfolded end with water. Heat a medium skillet over medium to medium/high heat with enough canola oil to cover the egg rolls half-way up the sides. When the oil is ready, the eggrolls should sizzle. Cook a few minutes per side, or until golden brown. 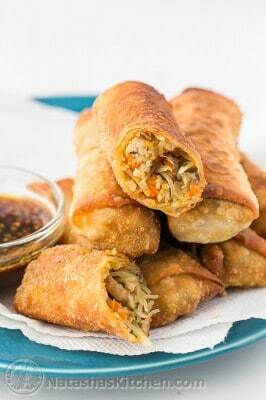 Slightly cool egg rolls on paper towels and serve with your favorite oriental sauce, or eat them as is.